This is actually a very good selling point. 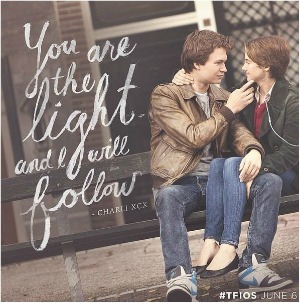 The movie The Fault In Our Stars opens today and it promises to be a blockbuster. Based on the successful YA book of the same name, reviews so far have been great, the stars Shailene Woodley and Ansel Elgort are beautiful and charming and it has a loyal following. So loyal in fact that Buzzfeed could create this listicle of 15 “incredible tattoos” inspired by the book. The book/movie is about 16-year-old Hazel Grace Lancaster (Woodley) who is dying of lung and thyroid cancer. She goes to a group therapy session and meets 18-year-old Augustus Waters (Elgort) who has lost his leg to cancer. A once-in-a-lifetime romance ensues. And, given the circumstances, it will come to a tragic end. Which means that all the teen girls and millennials (and OK yeah, the 35-pluses who love a good romance) who flock to see this movie will be crying all the tears that there are to cry. This is already trending on Twitter. And this is a good thing. “Based on John Green’s smash hit novel, TFIOS, as it’s commonly referred to on the Internet, is pitched nearly perfectly in a frequency that many of us can detect, but that particularly sends certain young people into hysterical fits. Meaning, this hugely anticipated movie does exactly the job it’s meant to do,” writes Richard Lawson in his review for Vanity Fair. We want to be struck by things. Moved by them. This is why those P&G Olympics ads with athletes thanking their moms are so effective. Even though we get all blubbery and snotty, to be that affected is somehow therapeutic. If you can sock someone in the gut and hit home with a powerful emotion or message, you’ve got them. There’s a Fiona Apple song in which she sings, “I just want to feel everything” over and over. Yup… true words. Certainly with this storyline, no one would expect TFIOS to be a barrel of laughs. But note, in addition to VF and USA Today, Time, The New York Times and New York magazine’s Vulture blog all have headlines that talk about the crying that will happen when you watch this film. “Maybe not since Titanic has a movie threatened to so thoroughly burrow itself into young hearts only to beautifully break them by the end credits,” Lawson continues. I was one of the young women in the middle of street after a midnight showing of Titanic, wailing for Jack. I have since seen the movie from beginning to end no fewer than six times. Probably closer to eight. It’s predicted that this movie will rake in between $35 million and $40 million this weekend, with Fandango saying it has the biggest pre-sale numbers in the company’s history for a love story, and the biggest pre-sale for a drama this year. Summertime is usually the time for CGI and things that go boom. But there’s never a bad time for a good cry.